With over 440 acres of trees, shrubs and plants, as well as a massive collection of plant records and specimens, the U.S. National Arboretum can be an overwhelming place for first-time visitors and skilled researchers alike. Beginning this month, however, guests can plan their Arboretum visit in advance using a new web mapping application developed by Blue Raster. Arboretum Botanical Explorer (ABE) will allow visitors to investigate the Arboretum grounds and collections through a searchable database and interactive maps. 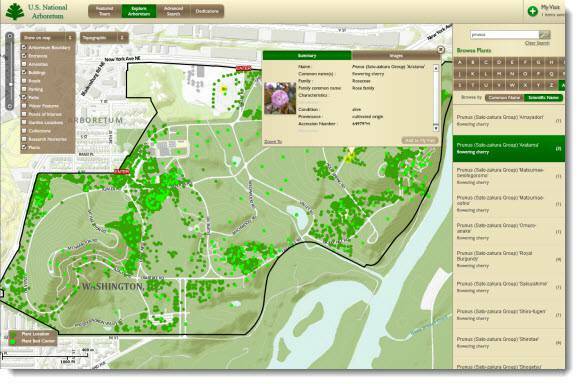 Working with the National Arboretum and its parent agency, the U.S. Department of Agriculture, Blue Raster replaced the Arboretum’s legacy system with an ArcGIS Server geodatabase to manage their collection. A custom application was then developed that enables users to access and display information from the Arboretum’s botanical collection, maintained in BG-Base, and its photo repository in Asset Bank. The collection includes more than 30,000 plant records and information on more than 60,000 specimens (plant leaf or cutting). To prepare for their trip to the Arboretum, visitors and researchers can use the application to create maps that show the location of specific plants on the grounds, as well as points of interest, dedicated trees and benches, special collections and amenities. Visitors can explore the interactive maps of the Arboretum’s featured tours of cherry trees and herb gardens, and learn details about each plant on the tour. Researchers, horticulturists, and visitors can use the application to create reports with photos and attributes of the specific plants they are studying. To view the National Arboretum’s Botanical Explorer, visit http://usna.usda.gov/abe/.